Connecting the Bolivian city of La Paz with its jungley neighbour nearly 70km away is The Yungas Road. Few people recognise this name though as it is more commonly known as one of the most dangerous roads in the world – ‘Death Road’. Death Road got its friendly little nickname because it was built by Paraguayan prisoners of war. Oh, and because around 300 people died each year on the road – either in collisions with other vehicles (it’s barely wide enough for one car, let alone two way traffic), or from plunging 600m off the cliff which marks the road’s edge. A new, paved two-lane alternative was completed 15 years ago and the original Death Road was closed to vehicles. 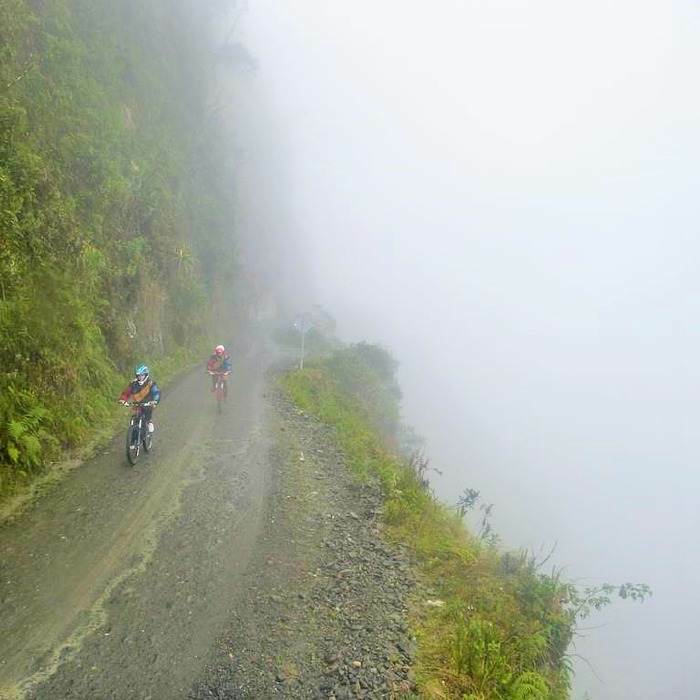 Now the home to a burgeoning adventure tourism attraction, Bolivian Death Road mountain biking is a must-do day tour for anyone who finds themselves in this region. This isn’t an adventure you can tackle on your own but there’s a multitude of Death Road biking tour companies to suit any budget. Tours range from $50USD to $120USD depending on how much comfort you’re willing to sacrifice. This money will get you a sweet bike (with suspension like you’ve never seen); a seriously cool padded outfit including gloves and helmet; guides; and all your food and drinks for the day. It is totally safe – unless you’re super hungover or still drunk from a night on the town, or are too busy trying to take a selfie than watch where you’re riding, you’ll have no problems at all! Mixing the perfect level of adrenaline with some of the most spectacular views, there’s really nothing else like it. The ride starts at 4650m above sea level at La Cumbra pass. It’s cold up there, wear warm clothes! Barren, snow-capped mountains rise up on each side and you’re eased into it with a lovely, wide paved road. There’s no need to pedal but the brakes get quite a work out as you find what pace is comfortable for you. If you’re an adrenaline junkie you can throw yourself down the hill as fast as you like but if you like to play it safe you can treat it like a trip to the shops on Sunday. And if it’s all just too much the support van is always right behind! You can bring a day pack for your things and leave it in the safety of the van so all you have to worry about as you ride is yourself. The real mountain biking starts after about half an hour. The road becomes a gravel-and-dirt track and dips down into the cloud forest. Things are misty and foggy and the vegetation threatens to consume the road. Hurtling down that path, grasping those handle-bars until your hands blister, is one of the most thrilling, liberating feelings in the world. All you can hear is your heartbeat in your ears and the rapid crunching of the gravel as you tear over it. To your right is a sheer mountain, surreally close to your left is cliff. And nothing else. The 60-plus kilometres of ride is broken up by mini breaks to gather the team and check that everyone is ok, and to have photos at particularly magical moments. There’s no point bringing a camera – you’re not allowed to have it with you on the bike for safety reasons. You need to be concentrating fully on the road and not the perfect shot for Instagram. One guide is the appointed photographer and will make sure that your bravery is well documented! However, if you own a Go Pro do NOT forget to pack it! Most helmets are equipped with Go Pro mounts or if you have your own clip you can attach it to your handlebars. Another option would be a Go Pro chest mount. The road descends 3500m and by the final stage you’re surrounded by lush, humid jungle and those warm clothes are abandoned. Down to shorts and t-shirt and the mandatory knee- and elbow-pads, the last hour is when you put the hard work in. You’ll need to bring some sun protection cream for face and body and some insect repellent for this part. Make sure you pack a change of clothes because you’ll be filthy with dust and some hand sanitising wipes, sweat and the water that the occasional waterfall dumps on you as you ride through. Filthy, but totally stoked; high on adrenaline, impressed with your abilities, with endorphins charging through you from one of the best experiences in all of your South American travels. After the victorious ‘we survived!’ photos taken with the whole team wearing the Death Road Survivor t-shirts that are part of the tour package; the van collects everyone and everything up and takes you to a resort for the real cherry-on-top of the day. An hour or so is spent at the resort where there’s showers, a full buffet and a swimming pool. If you’re with a decent tour company they’ll provide you with a towel so there’s no need to bring your own. Pack your swim wear for a relaxing dip (it’s warm down there in the jungle!) and bring a few Bolivianos to buy yourself a celebratory beer!